Our Fogging system cools the outdoors, creates amazing visuals, helps in humidification etc. We are providing Fogging Treatment Services for all Commercial and Industrial spaces. - Fogging can be either cold or warm (thermal) and is used against flying insects. Due to opulent industry skill and practice, we have been capable of providing our valued patrons the best quality range of Fogging Solution for mosquito killer. 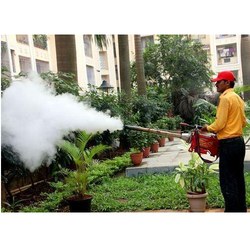 Fogging Services rendered by us is used in large area to prevent flying insects like mosquitoes and flies. These services are done in a large area in order to control many pests at the same time. Our services are remains effective for a long term. We are looking for queries from Nashik and Pune. We are leading service provider of Fogging Treatment Service. With the help of hard-working crew of personnel, we are affianced in offering unique services of Fogging Service For Dengue for respected customers. These presented services are extensively demanded owing to their customer conscious approach, hassle free completion and efficiency. Also, our assurance to meet with the desires of our patrons with our services makes us most admired market name. The fogger is capable of dispersing disinfectants, deodorizers, germicides and insecticides for application in greenhouses, a wide range of warehouse and for outdoor pest control in parks, garden and golf course. Ours is a well reputed organization that is engaged in rendering Flying Insects Fogging Treatment Services that is concentrated mainly on all surfaces that are in accessible. Fogging is performed by smoke generators and is very effective against flies and mosquitoes. Flies are known to spread diseases and our focus is mainly on removing flies from the surroundings and makes it safer. Meeting the demands of clients as a service provider, we are engaged in offering Fogging Treatment Services. Mosquitoes are known for spreading dangerous diseases. Our fogging machine is very modern and covers large area. Fog which has chemicals to remove mosquitoes, moves along with the particles and eradicate presence of mosquitoes.